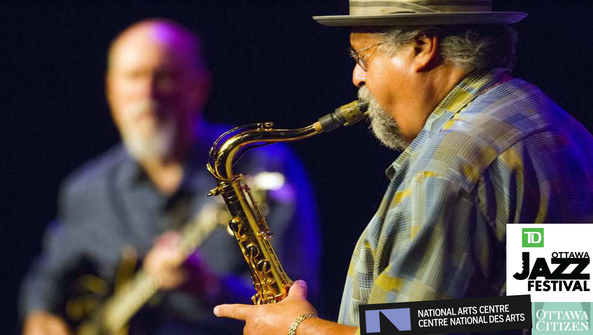 Continuing a collaboration that reaches as far back as their 1990 album Time On My Hands, guitarist John Scofield and saxophonist Joe Lovano returned to Ottawa on Saturday night for a blockbuster show at the National Arts Centre Theatre. Joined by the celebrated drum-bass pairing of Ben Street and Bill Stewart, the pair presented music mostly from Scofield's 2015 record Past Present. If you've attended one of the band's concerts over the past little while, the set list will come as no surprise. Lovano's explosive Cymbalism kicked off the performance. The two frontmen's musical relationship was on display here, as they slipped in and out of the tune's melody between improvised exchanges. Somewhat remarkably, they never got in each other's way, and this same trick was also used on Scofield's melancholy Mr. Puffy. Throughout the concert, their rapport gave the impression of two old friends having an amiable (but animated) conversation. Lovano and Scofield complemented each other impeccably, as could be heard in their unison rendition of the melody of Scofield's Museum. On the blues Past Present, however, it was Stewart that stole the show with his brilliant interjections into the pair's improvised dialogue. The drummer also delivered a powerful solo over a closing guitar/bass vamp. In a poignant contrast, the band then shifted into Hangover, on which Lovano played with tenderness and lyricism.